Our most popular seller in teak, this elegant teak chess set has turned out to be the best mix of size, weight, and art. Qty is the total quantity per piece, black and white. 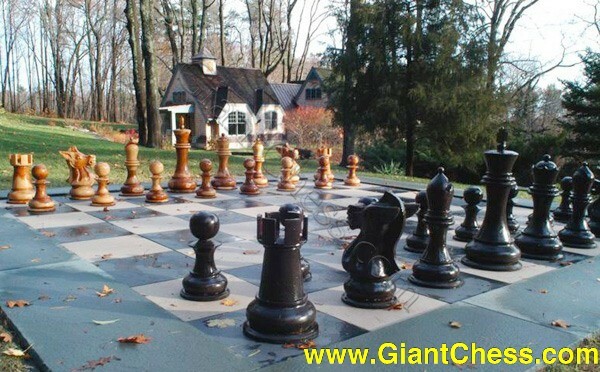 Each chess set ships with the regulation 32 pieces. Width is the diameter of the base, and Height is the distance from the base to the highest part of the piece, each measured in inches. Weight is the weight of each single piece. Everything is accurate to ±15%. 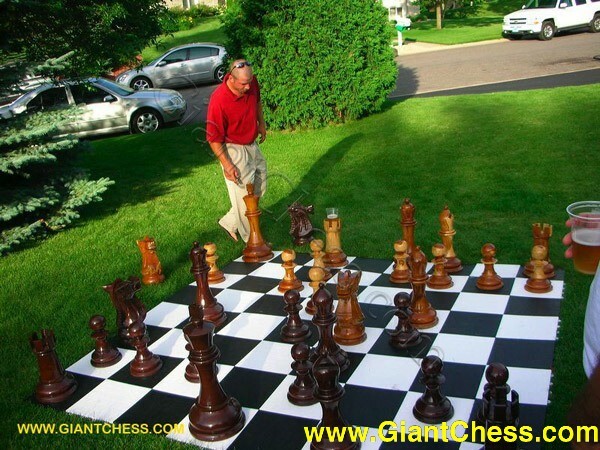 The total weight is for all 32 chess pieces, not including shipping materials. 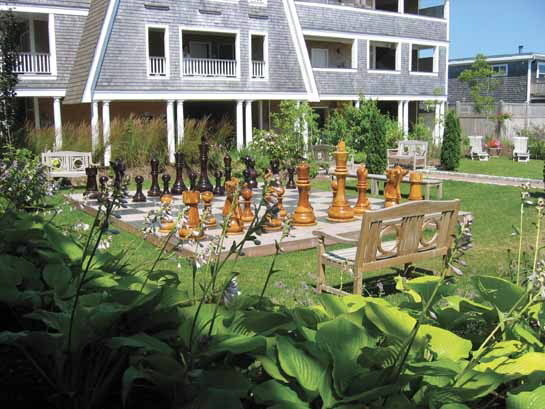 Teak is popular with upscale homes and resorts because of its luxurious marbled wood grain. 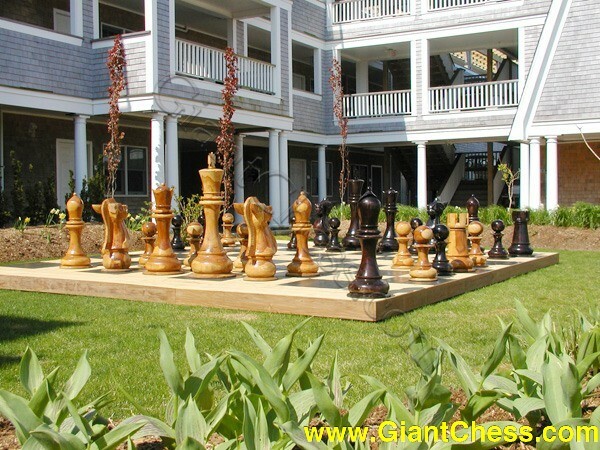 Teak chess pieces make outstanding decorations. What kind of teak do we use? 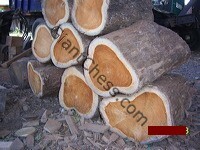 Like most lumber, teak comes in various grades. Ours is ungraded and would be considered a low grade by furniture makers, in fact, unsuitable for construction applications. This is because our artisans look for stumps, burls, and large-sized rejects of the teak industry. Not only does this save you money, but it is also where teak best showcases its elegant swirling grain structure. This is also our concession to the environmental causes that seek to reduce the cutting of the rain forests where some teak comes from. See our Environmental Statement for more on that. Our teak choices come with compromises. The teak is more likely to have voids (which of course we fill) and cracks (which are easy to repair). And it is a little harder to work (but our artisans have the experience to handle that). We look at this proudly as the result of choices to use the most beautiful teak available, and to keep our world beautiful, too. Contains 64 interlocking 12" squares. 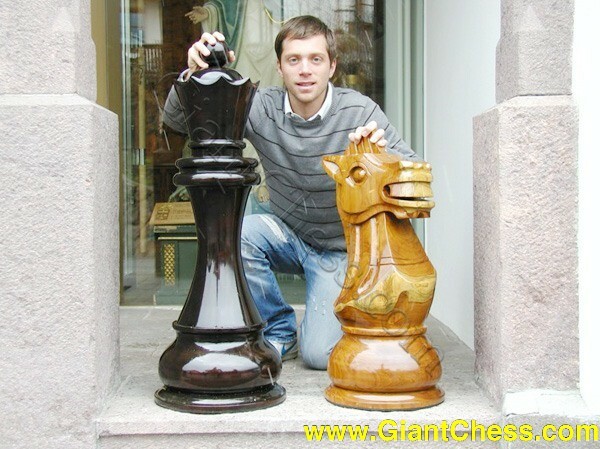 Suitable for the 24" Chess sets. Made from solid Teak. Contains 64 interlocking 8" squares. 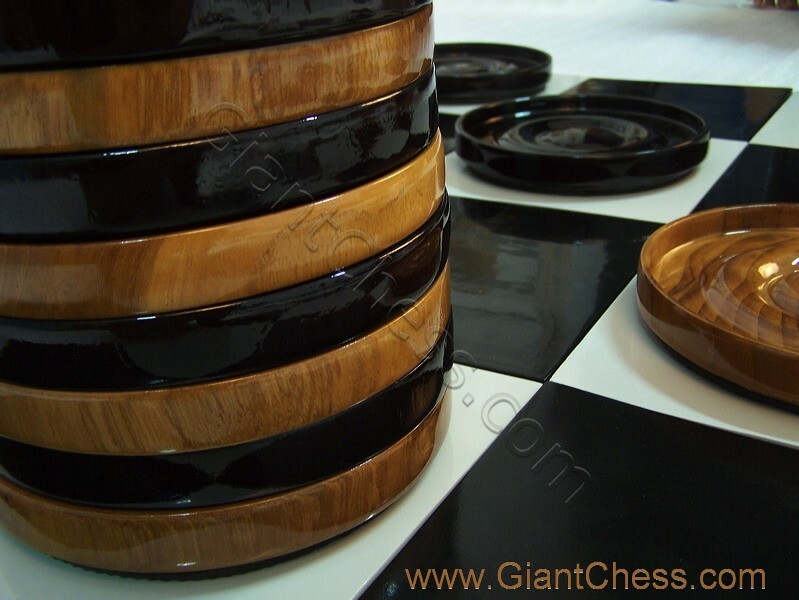 Suitable for the 16" Chess sets. Made from solid Teak. Contains 64 interlocking 6" squares. 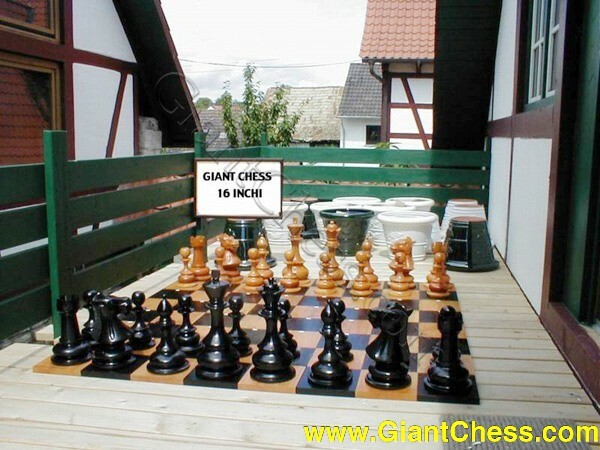 Suitable for the 12" Chess sets. Made from solid Teak. Contains 64 interlocking 4" squares. 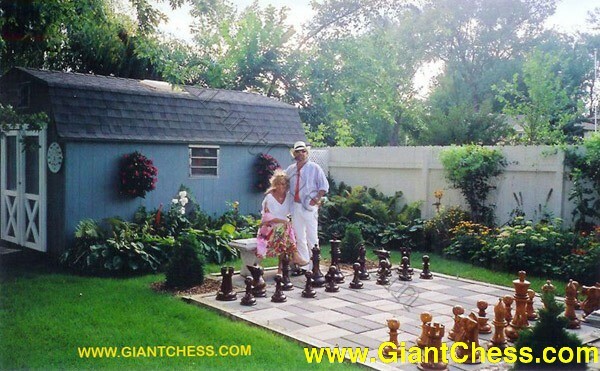 Suitable for the 8" Chess sets. Made from solid Teak. 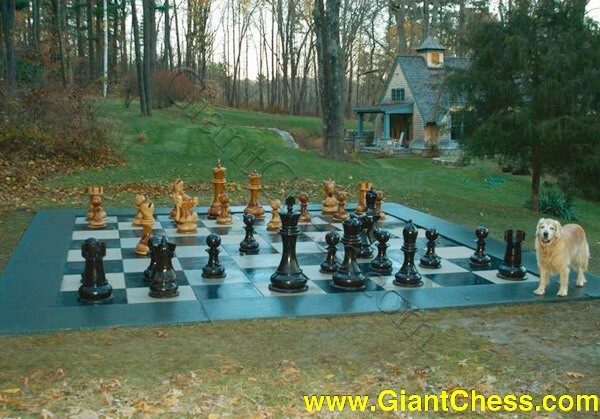 This Checkers set is for use on the same playing surface as the 36 Inch Teak Chess Set and is ideal for both children and adults. Actual dimensions: Each counter is 15.5" (38 cm) in diameter. 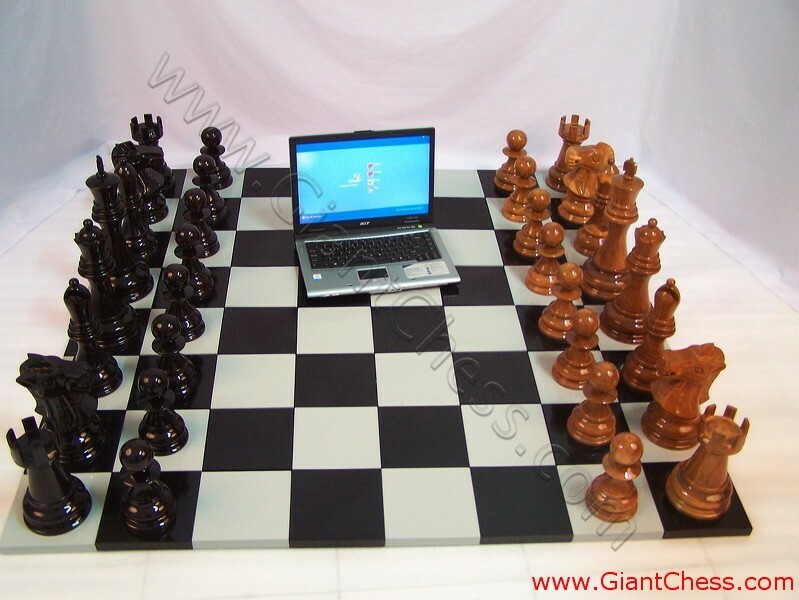 This Checkers set is for use on the same playing surface as the 24 Inch Teak Chess Set and is ideal for both children and adults. Actual dimensions: Each counter is 11.2" (28 cm) in diameter. 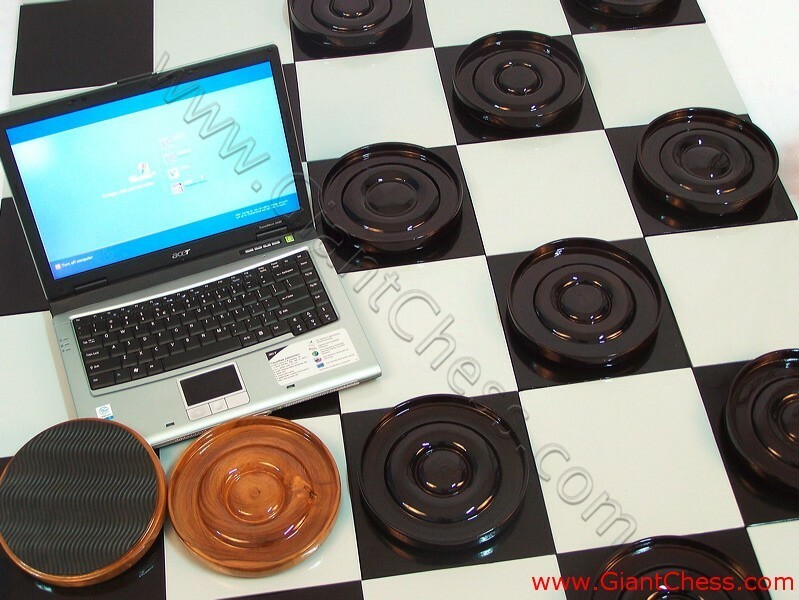 This Checkers set is for use on the same playing surface as the 16 Inch Teak Chess Set and is ideal for both children and adults. Actual dimensions: Each counter is 7.5" (19cm) in diameter. 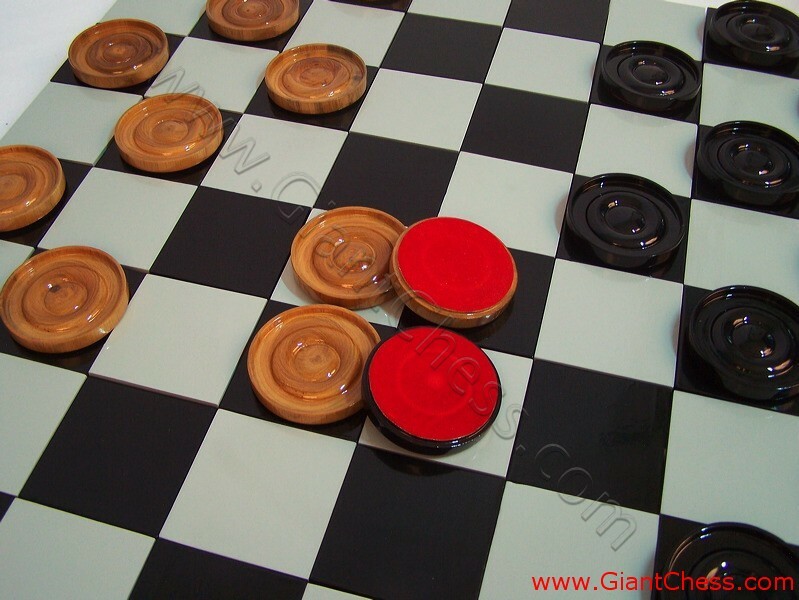 This Checkers set is for use on the same playing surface as the 12 Inch Teak Chess Set and is ideal for both children and adults. Actual dimensions: Each counter is 5.5" (14.3 cm) in diameter. 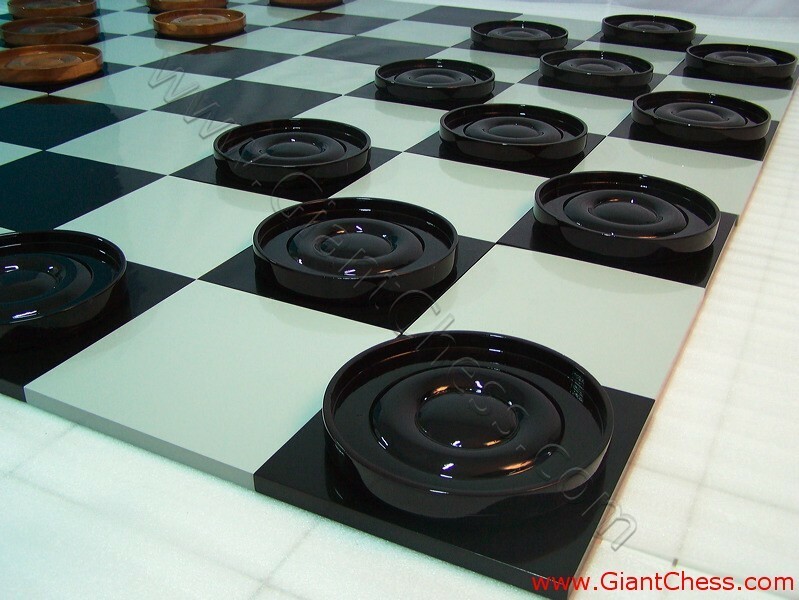 This Checkers set is for use on the same playing surface as the 8 Inch Teak Chess Set and is ideal for both children and adults. Actual dimensions: Each counter is 3.75" (9.5 cm) in diameter. The set comes complete with the standard 24 playing pieces. This set is ideal as a permanent fixture outdoors and makes a stunning centrepiece to gardens and yards. - Width is the diameter of the base. - Height is the distance from the base to the highest part of the piece. Our sets are handmade so measurements can vary by ±10%. We recommend using coloured garden tiles and paving flags which are readily available from garden nurseries and hardware outlets. The optimum size = 18" (45cm) squares giving a total board size of 12' (3.6m) x 12' (3.6m). 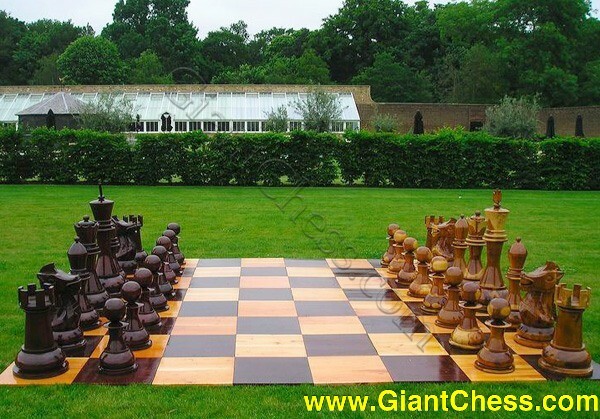 Please note that teak chess boards are not available in this size. We recommend using coloured garden tiles and paving flags which are readily available from garden nurseries and hardware outlets. The optimum size = 18" (45cm) squares giving a total board size of 12' (3.6m) x 12' (3.6m). Optimum size = 12" (30cm) squares giving a total board size of 8' (2.4m) x 8' (2.4m). King - 7¼"(18cm) x 16"(40cm), 1.8kgs. Queen - 6½"(16cm) x 14"(35cm), 1.3kgs. Rook - 6¼"(16cm) x 9½"(23cm), 0.9kgs. 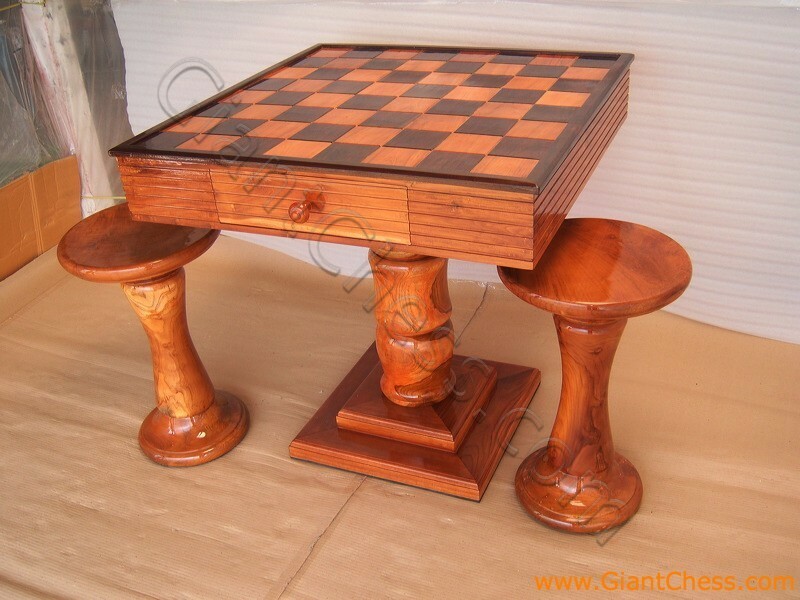 This stunning package contains a Teak Chess Set, Checkers Set, Table with inlaid Chess Board and a Double Teak stool. 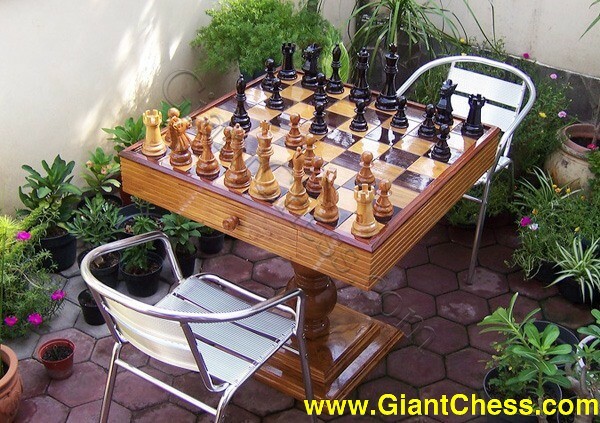 The Table is a unique piece of furniture handcrafted in Teak containing 2 pull out drawers for the storage of your chess and checkers pieces. 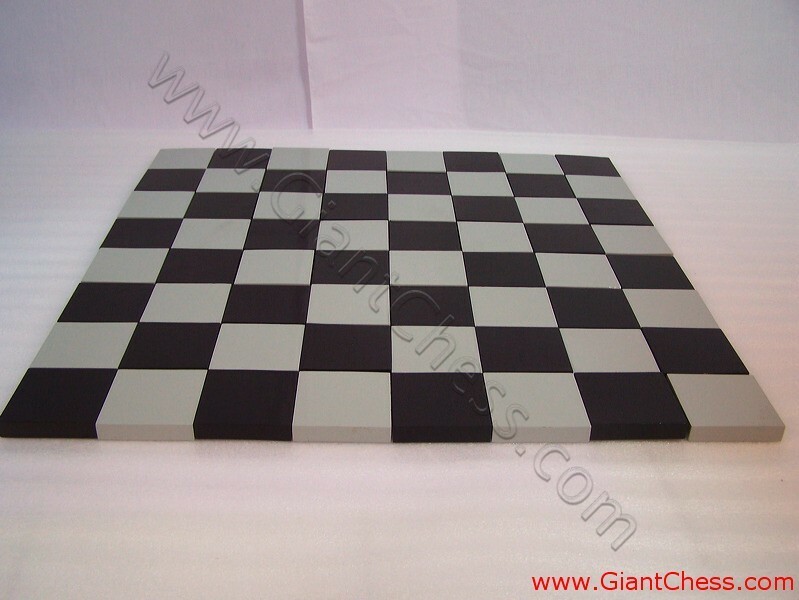 The board consists of 10cm square playing tiles which is suitable for the 8" high (20cm) Chess and Checkers set supplied with the package. The Teak used in our sets is derived from stumps, burls, and larger-sized off cuts not utilised by the rest of the teak industry. Not only does this save you money, but it is also where teak best showcases its elegant swirling grain structure. This source of timber is also an environmental concession as no timber is specifically harvested for our products. Our choice of teak comes with compromises. The teak is more likely to have voids (which of course we fill) and cracks (which are easy to repair). Teak is an extremely durable and hard wearing timber, making it a perfect wood for extended outdoor use. Our pieces are sanded, stained and sealed to help protect them from the elements. 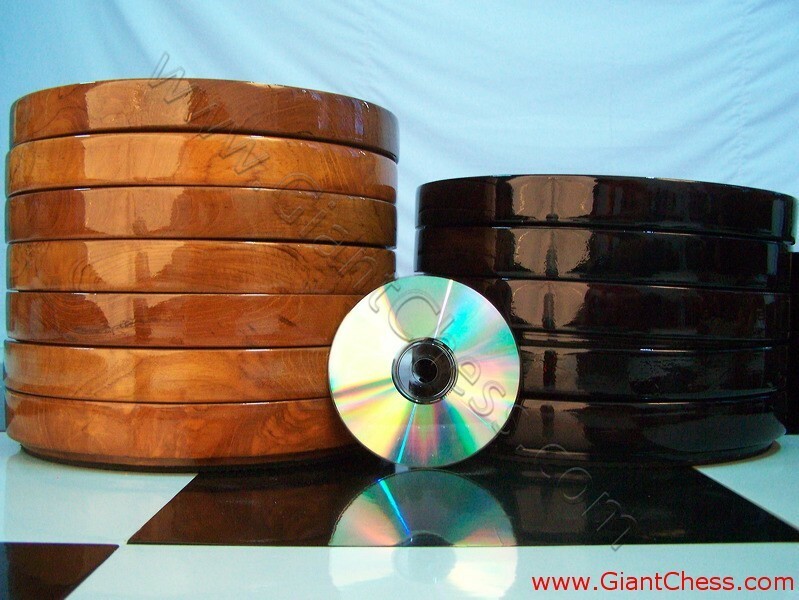 Even un-sealed teak is an extremely durable product. 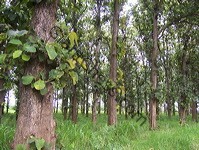 Teak can take up to 2 years to completely cure (dry out). Unfortunately it is cost prohibitive to wait 2 years for our pieces to cure before we ship them. 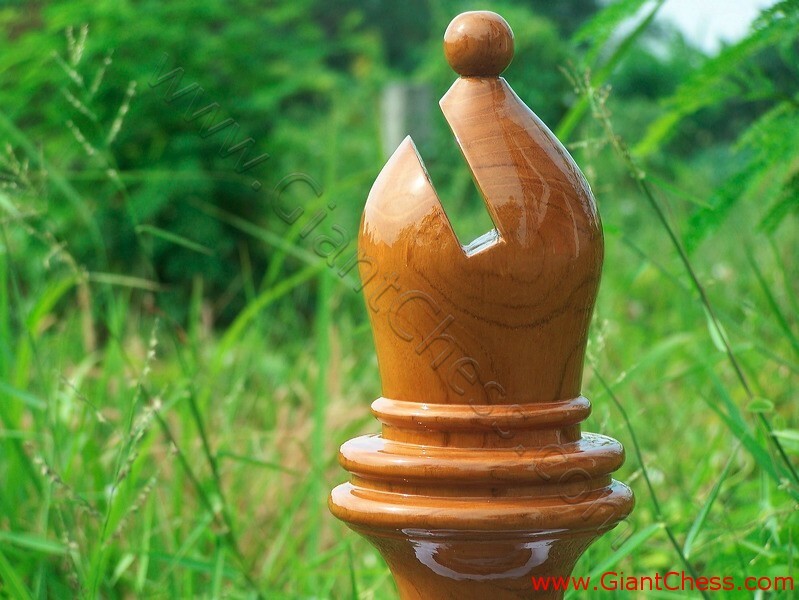 It is not uncommon for the Chess pieces to develop small cracks over time, especially during the curing period. These are natural, unavoidable and add character to the pieces. 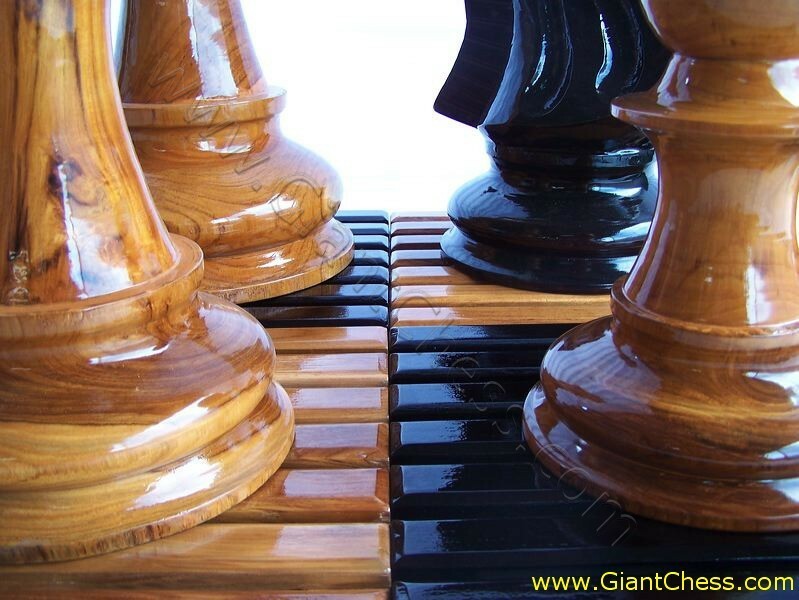 To help reduce the amount of cracking and splitting periodically rotate the chess pieces so that the same side is not always facing the sun during the curing period. This will not be an issue if the sets are being used regularly. We also recommend storing your teaks sets out of direct long term exposures to the elements - particularly hot, dry conditions to assist in good care. Each piece is protected by quality WoodkoteÂ® Flagship UVÂ® professional or Rust Oleum Spa Varnish exterior polyurethane wood finish. Specifically formulated for heavy wear and ultra violet protection, these products outlast conventional clear finishes. They provide an unequaled shield for both exterior and interior wood, making them ideal to care for your investment when exposed to the elements. 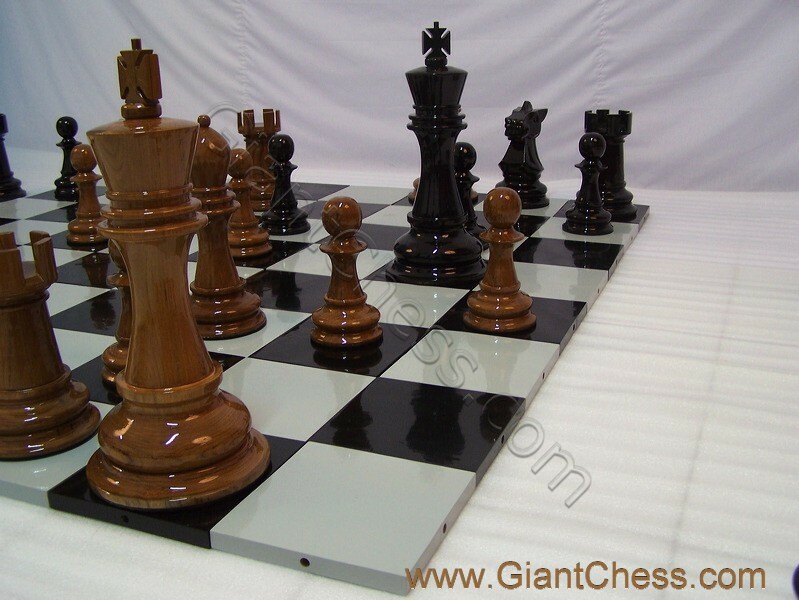 More information on these finishes can be found at www.woodkote.com or www.rustoleum.com To find the cost of the individual pieces please proceed through the chess pieces option. Siamo un giovane team della Val Gardena che dal 2006 offre figure di scacchi in legno Teak. Siamo attivi da cinque generazioni in un altro ramo della lavorazione del legno, eseguiamo Interni per Chiese; questo ci portò alla decisione di estendere la nostra offerta agli Scacchi giganti. Le figure degli scacchi vanno da una misura di 20 cm fino a 180 cm. Si tratta perciò di Scacchi giganti, che possono essere riposti sia all’interno che all’esterno. Questo è reso possibile grazie all’enorme resistenza del legno Teak. Forniamo il Vostro albergo, parco , giardino , sala conferenze ecc. di un tocco in più. Gli scacchi possono essere molto di più che un gioco, apertura ai giochi! Vi siete mai chiesti perché una figura di scacchi debba essere più piccola della Vostra mano? 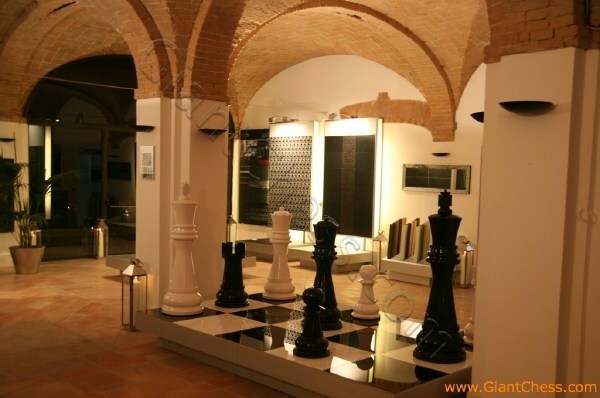 Noi, di Giant Chess Europa (Scacchi Giganti Europa) lo abbiamo fatto, e la risposta è semplice: non dovrebbe proprio essere così. Questa è la ragione per la quale offriamo figure di Scacchi in legno Teak per coloro che hanno voglia di giocare “alla grande”. I nostri assortimenti di figure di scacchi sono creati in diverse dimensioni e sono ideali sia per l’interno che per l’esterno. Abbellite il Vostro giardino, parco, albergo o la Vostra casa con una collezione di Scacchi giganti in legno Teak. Queste figure rappresentano manod’opera ornamentale – sono idonei per giocare a scacchi, non però come giocattoloi per bambini! Wir sind ein junges Team aus St.Ulrich im Grödnertal, Italien, welches seit einem Jahr Schachfiguren in Teakholz anbietet. Wir sind seit fünf Generationen in einem anderen Bereich der Holzbearbeitung tätig, der Kircheneinrichtung; dies brachte uns dazu unser Angebot auf Schachfiguren auszuweiten. Die Schachfiguren sind in verschiedenen Größen erhältlich, von 20 bis 180 cm. Es handelt sich daher um Riesenschachfiguren die sowohl für den Innen- als auch für Außenbereich geeignet sind. Das wird durch das extrem widerstandsfähige und wetterfeste Teakholz ermöglicht. Wir verleihen Hotels, Aufenthaltsräume, Parks, Privatgärten usw. die ganz besondere Note. Schachfiguren können viel mehr als Mittel zum Zweck sein, überzeugen Sie sich selbst davon!